If you are a pet owner or a parent you might be more aware of the struggles to keep the carpet clean. From food stains, drinks spill to common pet stains, a carpet can get multiple stains very quickly. In case you have a light color carpet, stains would be the last thing you want to see. 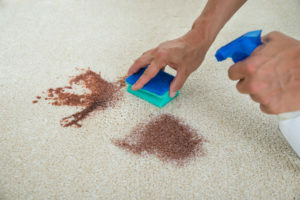 Grease/oil stains – When your carpet has oily stains such as grease, apply shaving cream directly on the stain, leave it for some time so it dries, and then remove the shaving cream by rubbing with a damp soft cloth. Additionally, you can also use cornstarch as to soak the fresh grease. Pet stains – Wipe it off as much as possible, then you need to sprinkle some baking soda on the stain. Then pat the stained area using a paper towel. Leave for some time, let the baking soda dry over the stain and then vacuum. Paint – If there is a paint stain, make sure you remove as much paint as you can using a sponge quickly as it occurs. Then you need to make a solution of vinegar, detergent, and 2 cups of water. Mix 1 ½ teaspoon of vinegar with 1 ½ teaspoon detergent with water and apply on the remaining stain and rinse it with cold water. Ink stains – Make a solution of milk and cornstarch to make a paste. Apply the solution on the ink stain. Let it dry over the stain for a few hours, then brush out the residue and vacuum it off. Coffee and tea stains – Take equal parts of vinegar and water and then blot the stain using a clean white cloth. Using club soda on these stains also works well. Call Us Today! @ 661-747-4441 to make your bookings.